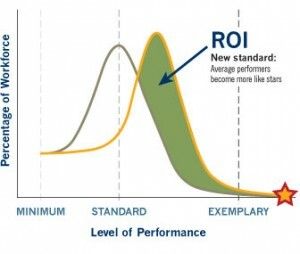 Simply put, shifting the performance curve is all about driving results, enhancing revenue, and improving margins. Our model and methodology allows organizations, their leaders and associated work teams to capture more value with existing resources. In a ‘do more with less’ economy, this is the right strategy for these times, clearly differentiating you from your competition. The underlying premise for replicating your stars is that exemplary performance is not reserved for just a few individuals. Exemplary performance is an achievable goal for the great majority of executives, managers, teams and individual contributors. Learn how we can help you significantly improve your business results with your current resources!